I hope you all are enjoying the week and hopefully enjoying a Spring Break if that applies. I am spending this week with my son in NC and soaking up some sun. Today, I am sharing with you a fun card I made using the new YNS Release of Wishing Well Fairy. I created this little scene using some distress inks for the background which was cut out using the YNS Stitched Rectangles Die set. Once the background was sponged in and blended, I stamped the image to be colored with Copics and cut out using the coordinating dies. 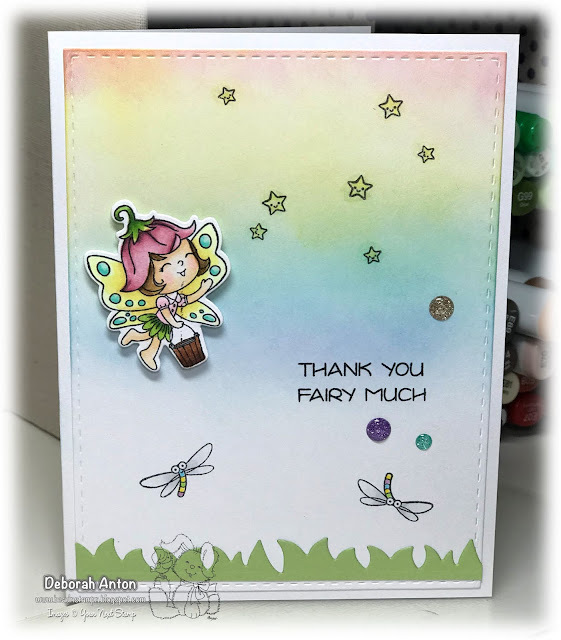 The grass was made using the YNS Chunky Grass die and the dragonflies from the stamp set were stamped directly onto the panel. The image was popped up with some foam tape and the little stars were also stamped directly onto the panel and some Wink of Stella was added for some sparkle. The card was completed with some new Pixie Dust Glittered Gumdrops. I hope this gives you a little more inspiration from this months YNS new release. Be sure to check out the YNS blog all month for more inspiration from the DT! Thanks for stopping by and hope you have a great one! There is still time to play along in the TCPTUES Challenge of Spring! The month is half over so still plenty of time to get your creation linked up and at a chance to win $50 to the TCP Store! The Cat Pack have made some awesome creations with this theme and you will not be short in finding some mojo to get your creative side going. 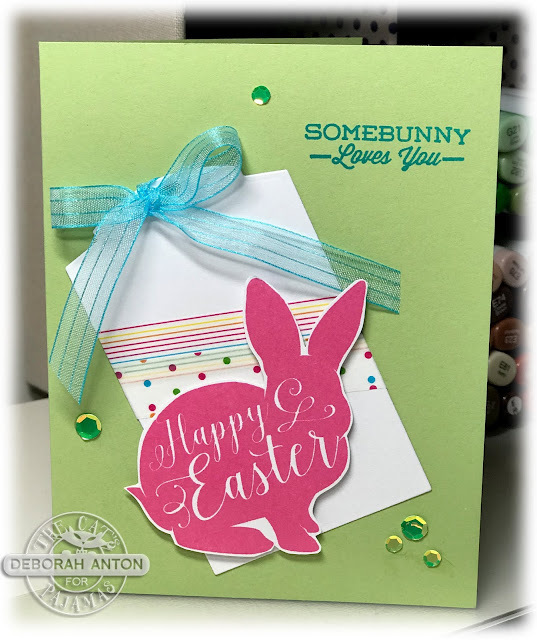 For my card, I am using the set of Happy Easter along with the Cut Up of the Wish Tag Duo. I started with some cardstock from SU! that I had in my stash. I believe this is Certainly Celery. I stamped the image with Rose Bud ink from Memento and fussy cut it out to pop it up over the tag. Once I had cut the tag out, I used some of my ever so neglected washi tape for the background and finished it with some sheer ribbon. 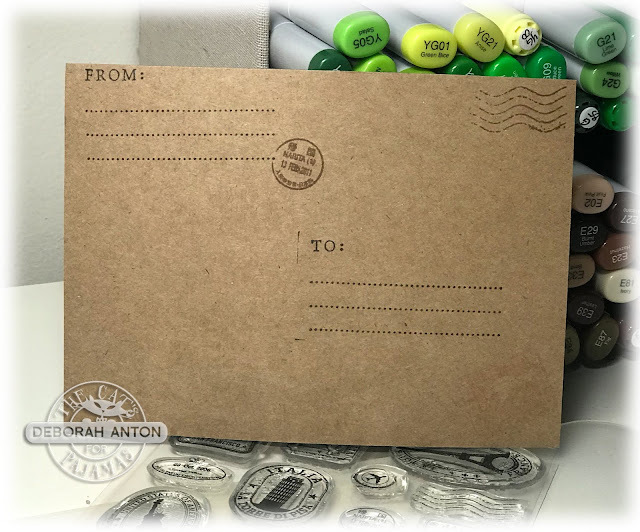 The card was completed with a few of the new Iridescent Green Hole-less Sequins TCP has in the store. Be sure to stop by the TCP Blog to see all the fab creations the Kitty Cat Pack have done. Make it a great one! 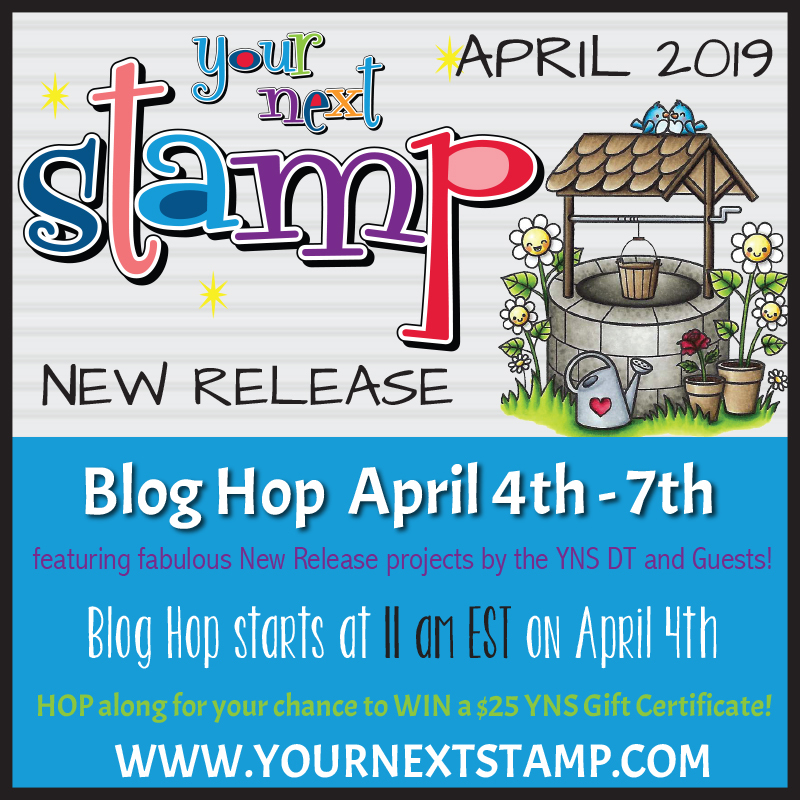 It's the April release day and blog hop with Your Next Stamp! I mentioned yesterday that this release is full of cuteness and fun, with some additional sets to compliment some current sets sold in the store. You have to check out the fun beach towel die that is perfect for making a shaker card. For my card, I am using the set of Photo Booth Thumbs Up. 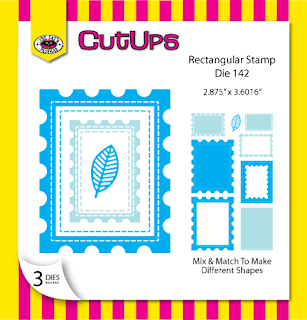 This is a great addition to the photo booth stamps sets already sold in the store. I paired up this image with the Photo Booth Polaroid die. How cute is this little guy with his friends? I stamped the image and colored him with Copics before layering that image with the Photo Booth die. I used some patterned paper I had in my scrap stash to make the background layer and popped up the image over it. The sentiment was stamped directly onto the base. These photo booth sets are so much fun and if you haven't checked them out, you need to head to the YNS Store and add them to your collection!! As always, Karen has a generous sale to sweeten the deal of all you have on your list. 20% OFF your ENTIRE ORDER! Be sure to use the code listed and it is only valid during the days mentioned. Thanks for stopping by and hope you have a great one! 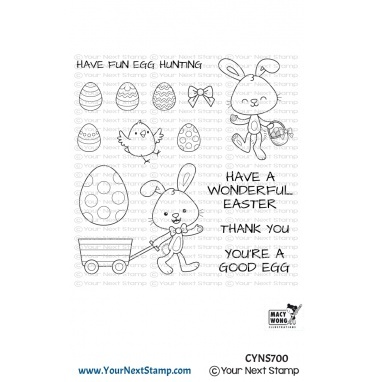 It's the April preview day with Your Next Stamp! 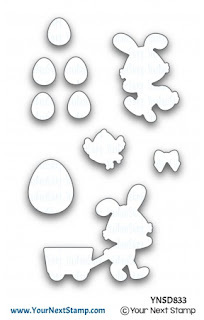 This release is full of cuteness and fun with some additions to some current sets sold in the store. There is even a super fun die that is perfect to make a fun summer or beach shaker card! For my sneak, I am sharing with you the new Whatnot Sentiments Thirteen. I always love great sentiment sets and this one is no exception. I have paired this sentiment with the new Stitched Fishtail Banner Die and the Flower Blossom Trio die set. I layered the banners before stamping the sentiment on top with the YNS Stone Grey ink and popping it up over the base. 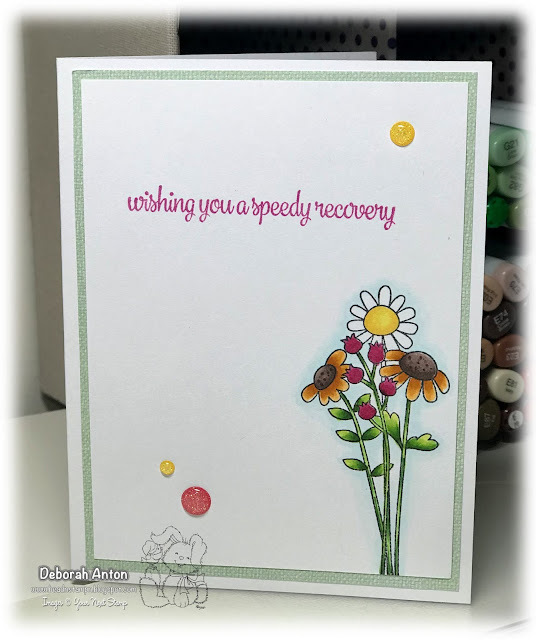 I cut out the Flower Blossom Trio in different colors and added them around the fishtail and completed the look with a finishing sentiment and some gumdrops. Thanks for stopping by and be sure to check back tomorrow for the release day and blog hop! If you would like to see all the awesome creations the DT have done, check them out here on the YNS Blog. Have a great one! Happy Tuesday everyone! It's time for another TCP Tuesday challenge and the Cat Pack have done some fabulous creations to fit the theme of "Spring." 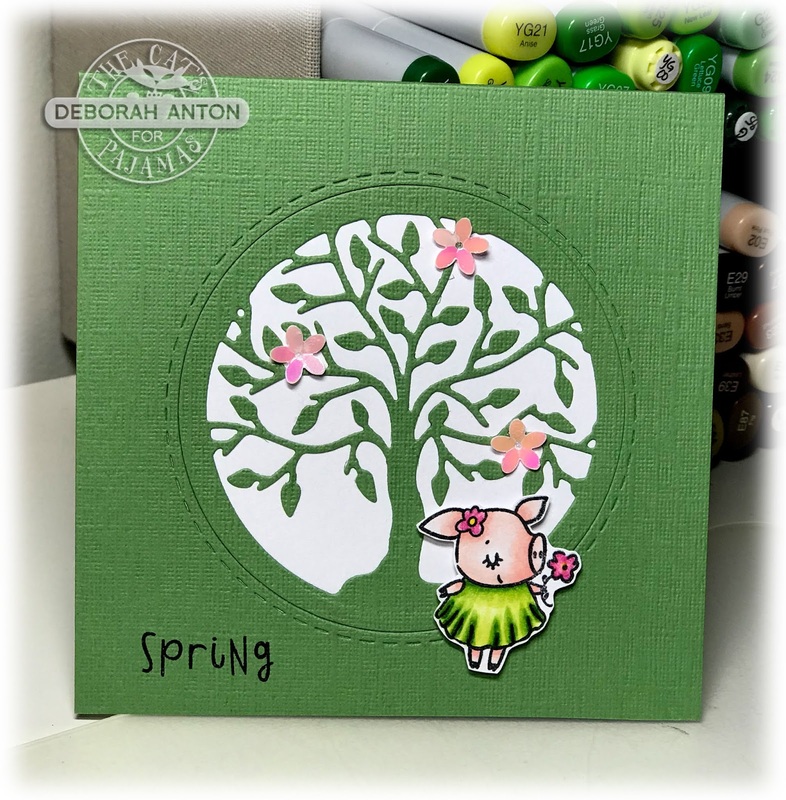 I have a card to share with you that I made using the new release set of The Year of the Pig and the new Spring Tree duo die. This stamp set is SO stinking cute that I am looking forward to many more creations using this set. This card is a 4.5 x 4.5" card size which I cut out the tree on the top layer and added a white background with some card stock on the backside. The cutie patootie pig was colored with Copics and fussy cut to be popped up just at the base of the tree. I finished the look with some of the new Spring Shaker confetti mix. A simple, but adorable little card perfect to just say hello to your friend. Be sure to stop by the TCP Blog to see all the awesome creations the pack have made. We'd love for you to play along for your chance at winning! Be sure to link up your creation. Thanks for stopping by and hope you have a great day! It's here!! 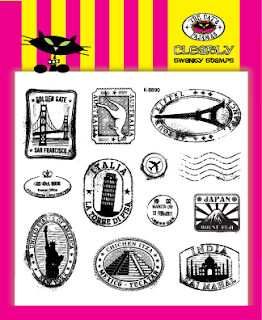 Release day and Blog Hop for The Cat's Pajamas Stamps. If you arrived here from the talented Rebekah, you are in the right place. If not, start here! I am sure you have all had a chance to peek at the wonderful creations the Cat Pack have done for the week and now is your chance to grab your list and get shopping! 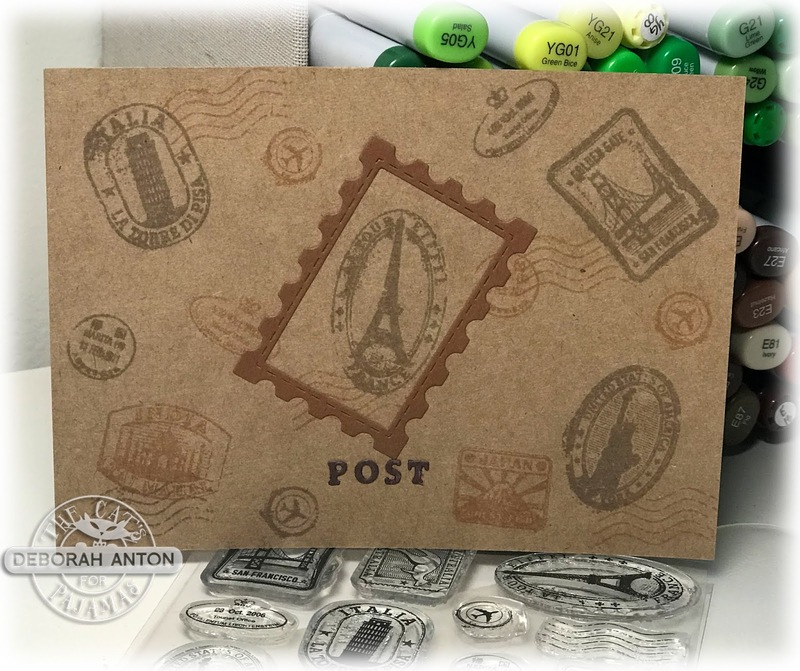 For today's release, I am sharing with you the new Travel Stickers stamp set which I thought I would take a crack at creating a postcard using these fun "stickers." I always love a postcard and I realized that making them was just as fun. 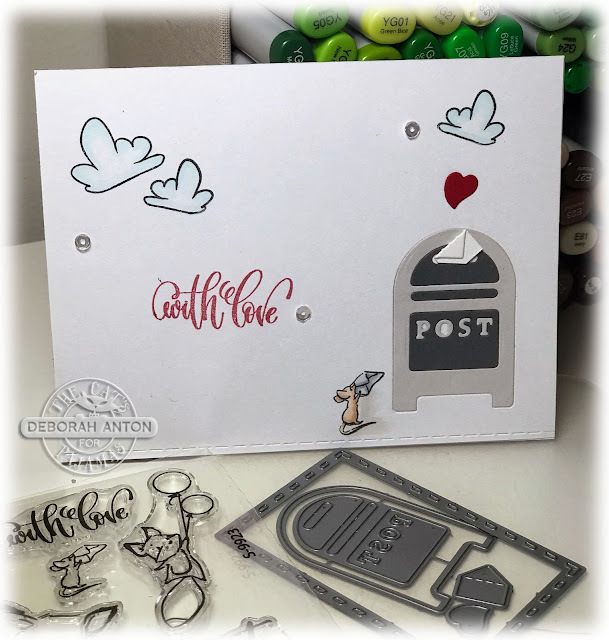 For my second card, I am using the ever so cute set of For Fox Sake and the new Mailbox die set to create this little love letter to be sent. 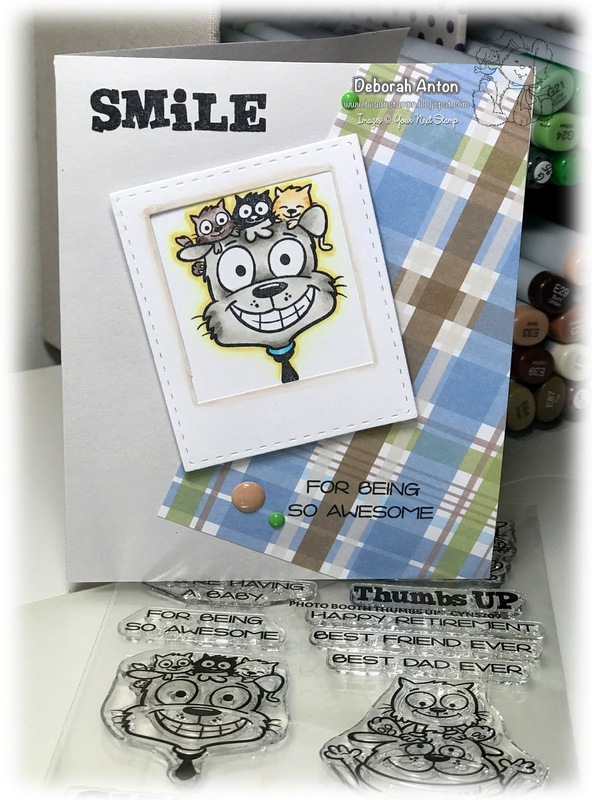 Thanks for hopping by and be sure head over to Alma's blog for more crafty creations and inspiration from the Cat Pack guru herself! 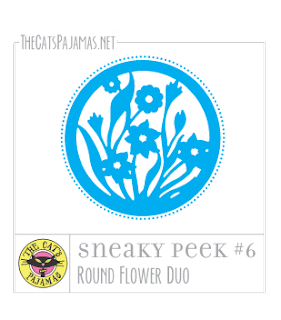 It is Sneaky Peek day 6 with The Cat's Pajamas Stamps! Today the focus is on the Flower Die Duo Cut Ups. This is such a fun die with many possible ideas. For my card, I have used this die along with the new release set of For Fox Sake which is cuteness overload! The Year of the Pig and For Fox Sake is just so stinking adorable this month. I love a lot of white space (if you couldn't tell from my past cards) and this was a perfect die to add a pop of color from behind using some fun Spring papers from Doodlebug & Co. and the little fox watering these flowers. The sentiment is also a perfect fit for the die and image. I finished the card with some new release Holographic Green Holeless Sequins. Eeep! More fun sequins!! If you haven't peeked at the other set of sequins coming out, be sure to head to the TCP Blog to see them! For a chance to win a $10 gift certificate to the store, comment on each of the designer's blogs including mine today and also on my Instagram account @beadnstampn. Check the The Cat's Pajamas Blog to see which designers are participating each day. Winners will be announced on The Cat's Pajamas Blog and Facebook page each day. Thanks for stopping by and make it a great one! 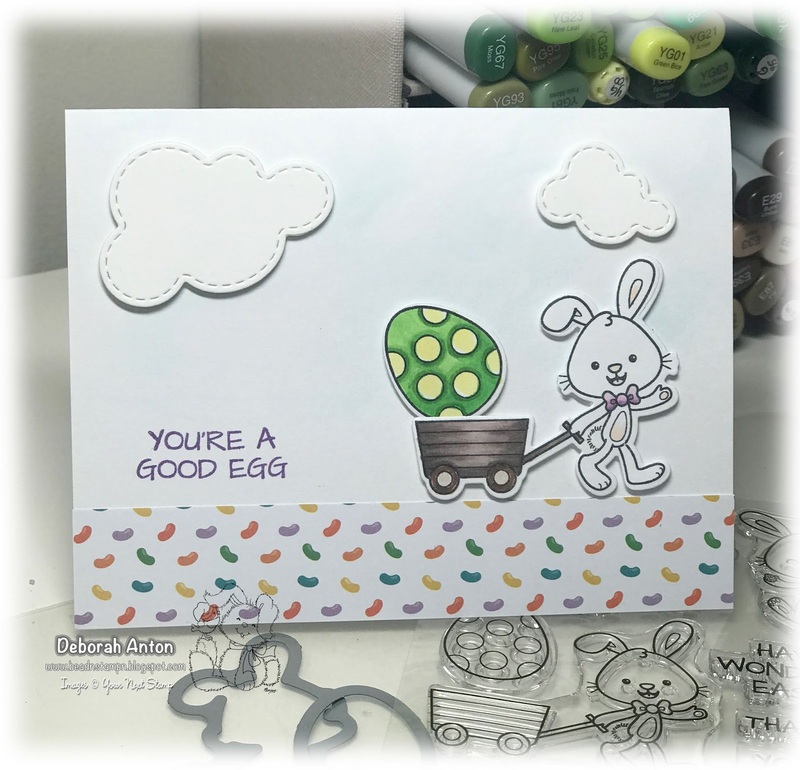 Today I am sharing with you a card made from the new set of Egg Hunt. Isn't it adorable? I love the sentiments it comes with and this one I used is just something I could see myself saying. Hahaha! This is a CAS card to focus on the image and the "good egg" that he is giving. The image was colored in with Copics and cut out with the coordinating die set. Using the YNS paper collection of Happy Spring, I created the road using the jelly bean pattern paper and finished the card with the Stitched Puffy Clouds die. We hope you have been able to check out all the fun projects over the last few weeks since the release to see all the additional projects the team has put together. 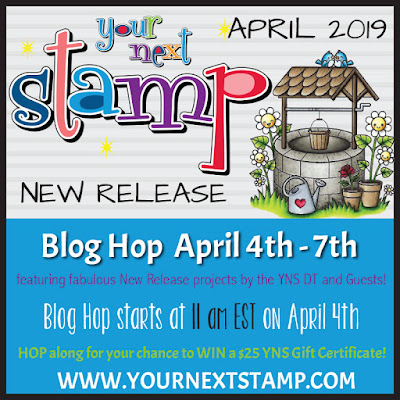 Check out the YNS Blog to get a glimpse of them all if you have missed any portion of the posts. Thanks for stopping by and hope you have a great Sunday! It's here! It's here! It's sneaky peek time with The Cat's Pajamas Stamps and you will not be disappointed when you see the cuteness this release holds. 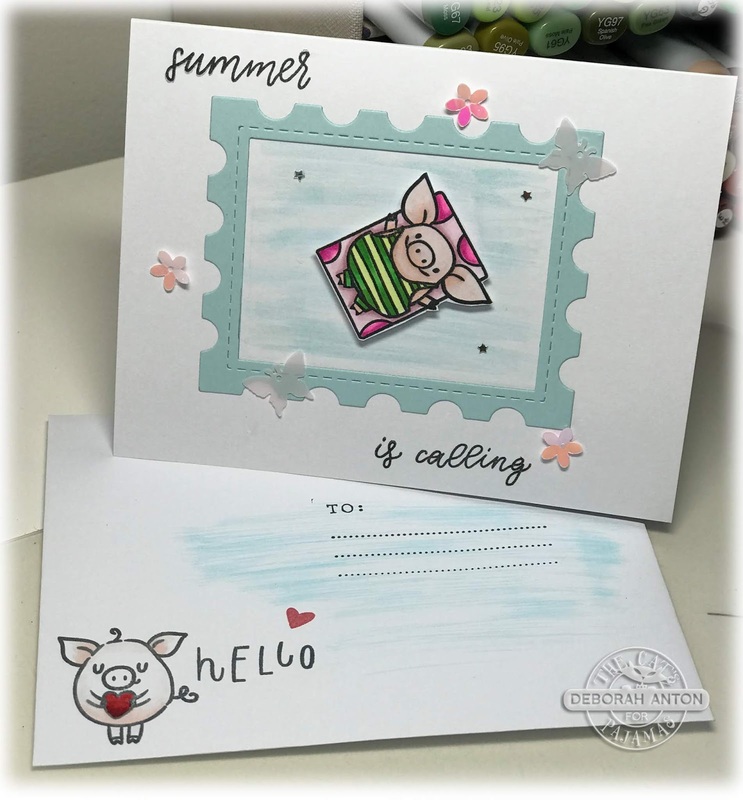 Today's sneak is The Year of the Pig and this little piggy is adorable! Pairing with the new Rectangular Stamp die, I created a "pool" with the frame of the die and added the floating pig on top with some foam tape. The water was created using some Distress Stain and the look finished with some of the new fun TCP Shaker Sequins. 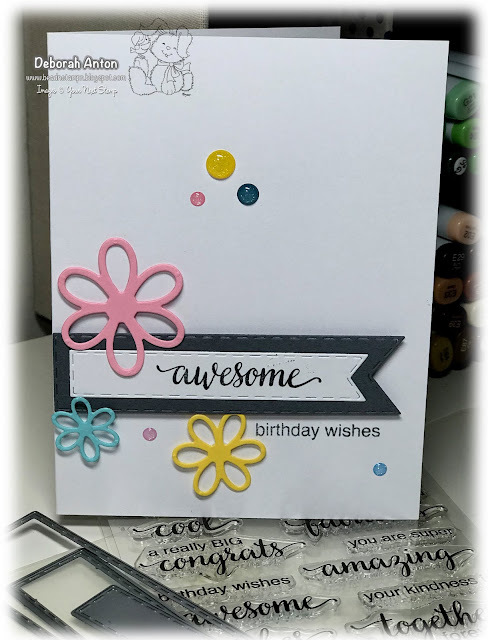 You will noticed the fun envie to match the card which was created with the same set and look. Join the Cat Pack in the current challenge of Envie Envy. 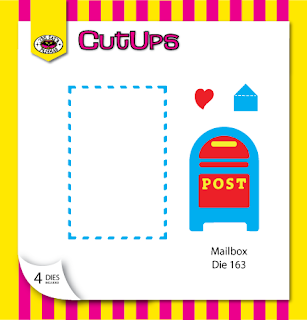 Get creative in designing an envelope for a happy surprise in the mailbox to your recipient.